Prayers are said in Church in the prayer corner each weekday at 12 noon. You are welcome to join us. Prayer requests can be written on the prayer sheet by the Church door, always respecting confidentiality. 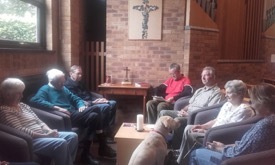 Our prayer group meets every Tuesday morning at 9.45am in the Prayer Corner. On the third Tuesday of the month we meet for breakfast at the Kingfisher at 9am and having asked fellow diners if they want us to pray for something specific we hold our prayer meeting there. When the need for prayer is urgent there is a prayer chain set up which is easily accessible.